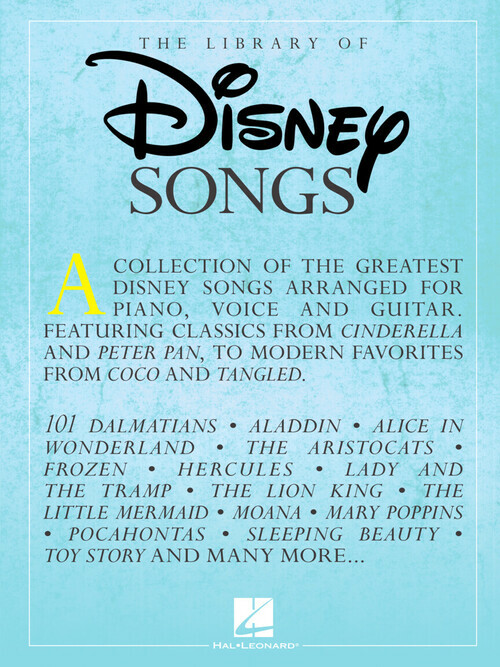 There are songs for everyone in this collection of over 50 popular hits arranged for piano, voice and guitar from Disney movies past and present. It features classics from Cinderella and Peter Pan as well as modern favorites from Coco and Tangled and much more. Also includes songs from the movies: 101 Dalmatians, Aladdin, Alice in Wonderland, The AristoCats, Frozen, Hercules, Lady and the Tramp, The Lion King, The Little Mermaid, Moana, Mary Poppins, Pocahontas, Sleeping Beauty, Toy Story, and more.